I drove approximately one hour from Guanzhou North. The market was quite typical, with some animals, mainly chickens and ducks, being sold openly. I identified the area where cats and dogs were being sold and I was able to film openly there. 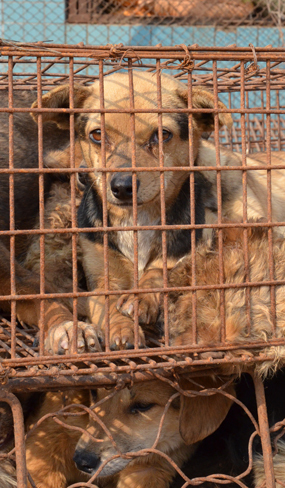 Both cats and dogs were held in small iron cages. Movement was difficult for these animals, who were forced into cramped positions. They were not aggressive, but very scared and cautious of people who approached their iron cages. Unlike the dogs for sale on the Guangzhou Jinrong Livestock Wholesale Market, all of the animals here I observed gave the impression of total submission. They were not aggressive, but very scared and cautious of people who approached them. The cats lay on top of each other, trying desperately to find some comfort amongst their companions. I really had the impression that these beings felt that their life was in great danger, and that their only way to escape a deadly fate was to beg humans for some mercy.